Anand Mahindra tweets what he does every morning to start his day on a positive note. If your day isn't going all too well - because, what else can you expect from a Monday - here's some neat advice from Anand Mahindra. 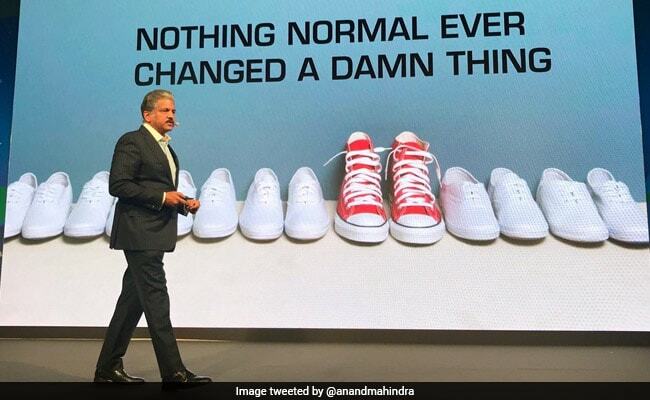 The Mahindra Group Chairman, a consummate Twitter pro, shared Monday mantra with his followers and chances are, you'll want to try it every morning as well. Anyone looking for a way or motivation to change their life needs to read the tweet. Posted earlier this morning, Mr Mahindra mentions what he does every morning in order to start his day on a positive note. The idea has impressed many on Twitter. "If you're looking for that one person that will change your life, look in the mirror." I read this many years ago and use my daily shaving routine to look in the mirror&start my day-and week-by recognising that only I can transform my life.. The tweet, since being posted, has collected over 3,500 'likes' and more than 800 retweets. "My late mother would tell me the best help you will ever find is at the end of your own arm," says a Twitter user adding to Mr Mahindra's advice. "That's a very nice thought," says a Twitter user. "Very inspirational and true," says another. A few people, who had certain reservations about the advice, had their queries answered by Mahindra himself. Good insight but how much do you give weightage to something called " Fate"
Wrong perspective. Look around u and see what needs u. That changes everything.my morning thought for years now. Be useful and not useless. Do you agree with Anand Mahindra's advice? Tell us using the comments section.